The Project Explorer gives a layout of the project and lets you navigate through its parts. The top line brings up the global Code and properties for the project. A Code Window tab will open, and the project’s properties will show in the Properties Window. Clicking on a line that has a form will open the layout of the form in the Design Screen. The form’s properties will show in the Property Window. Clicking on Code line within a form will display a Code Window with the code for that form and the form’s properties in the Properties Window. Clicking on a control within a form will bring up the Design Screen with the control selected on it. The properties of the control will show in the Property Window. Use the down arrow icon to move the currently selected item down the list, and use the up arrow icon to move it up. Controls higher on the list will go behind lower items if they overlap. Use the trashcan to delete the currently selected item. There is no undo. To change the name of a control or form, double click on its name in the Project Explorer, or edit the id in the Properties Window. 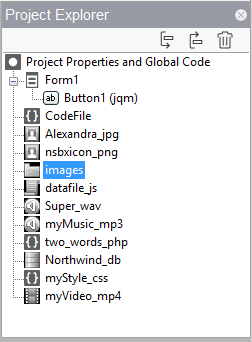 To add an external file or Code Module to your project, drag and drop it into the Project Explorer. The file will then be deployed with your project: there is no need to add it to your manifest. Files types can be folder, images (png, gif, jpg, bmp), sounds (wav, mp3), SqlLite databases (.db), and other common types (js, json, css). Keep the files which your project uses in your project's directory, so they can be properly deployed. Images Use images in the Image, PictureBox and other controls. All common formats are supported: .png, .gif, .jpg, .bmp. It gets deployed with the project. Folders Include a set of files, such as images. An Image control could then use 'images/myImage.png' It gets deployed with the project in the same structure. Subfolders are included as well. Sounds Use with PlaySound() function and the Audio control. Ends in .mp3 and .wav It gets encoded and deployed with your app. PHP PHP scripts are programs which run on the server in the PHP programming language. Ends in .php It gets deployed to the server. It does not download with your app. Databases SQLite databases can be read and written using the SQL functions. Ends in .db It gets converted to JSON and deployed with your project. When your project starts, the JSON is read and turned back into an SQLite database automatically. StyleSheets Use stylesheets to format the controls and elements in your app. Ends in .css It gets deployed with your project and is automatically loaded when your app starts. Video Use the Video control to play video. Ends in .mp4 It gets deployed with your project. This page was last edited on 5 May 2015, at 18:57.